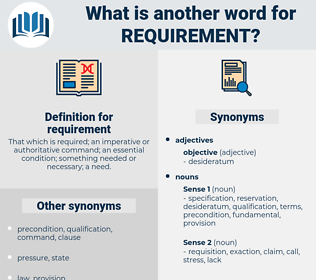 What is another word for requirement? That which is required; an imperative or authoritative command; an essential condition; something needed or necessary; a need. considerations, Measures, priorities, NS, seeks, settles, Requesting. dictates, restriction, commitment, principle, proviso, conditionality, factor, indispensable, assumption, minimum, component, recommendation, measure, limit, yardstick. Instituted, Enshrined, governed, defined, vests, Dealt. 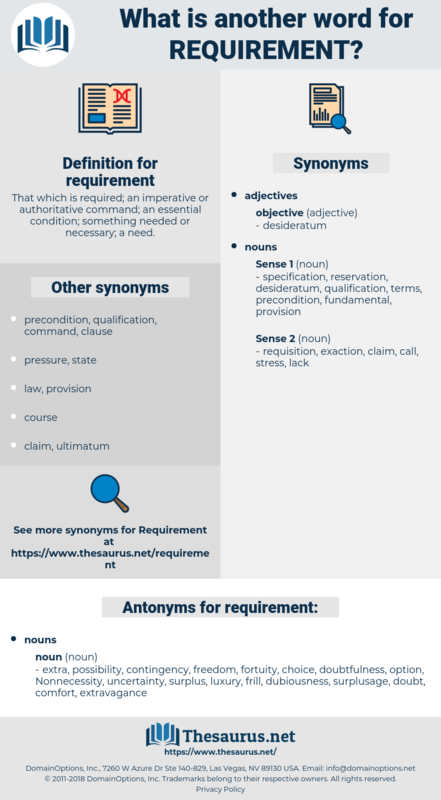 requirements, pre-requisite, required, require, Requiring, Criteria, requested, time-barred, imperative. preconditions, sections, required, require, obligation, obligations, Requiring, necessity, criterion, Criteria, requested, provisions, limitation, condition, prescription, Prescriptions. reads, pre-requisite, precondition, stipulation, pre-condition, required, element, insistence, require, obligation, constraint, premise, imposition, waiver, Requiring, necessity, precept, commandment, injunction, exigency, criterion, Criteria, requested, onus, threshold, compulsion, expenditure, limitation, imperative, amount, condition, norm, burden, appropriation, prescription. extra, possibility, contingency, freedom, fortuity, choice, doubtfulness, option, Nonnecessity, uncertainty, surplus, luxury, frill, dubiousness, surplusage, doubt, comfort, extravagance. It may often be possible to supply abundantly on the Home Acre this vital requirement of moisture, and I shall refer to this point further on. The third requirement of a valuable contribution, says the Chicago Commission, is the constitutional sanction. Rio Grande, recreant, recriminate, rack rent, recurrent.